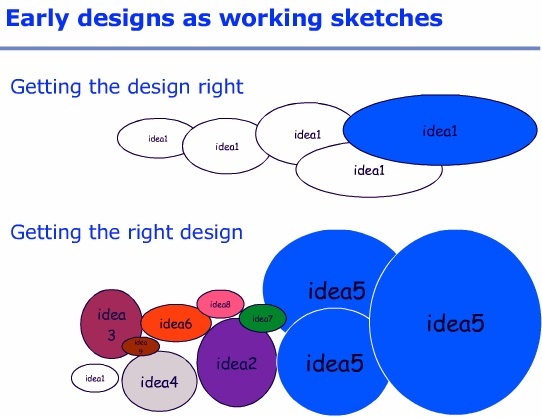 You need both: idea brainstorming and focus and evaluation. Zur Swiss Intranet Summit vor einem Jahr durfte ich den Abschlussvortrag halten. Hier nun zusätzlich zu den Slides auch die Audiospur! View more presentations from mprove. Ivan talked about leadership at Sun’s SEED summit 2006. The remarkable event has been captured on tape and is now online. Ivan Sutherland on Leadership, Sun 2006 from mprove on Vimeo. service design is interactive design meets industrial design meets advertising meets interior design meets graphic design meets sequential art. An interview with Pater Fossick by Paula Wallace. Insights On Innovation. Apple thinks good design is a present. Pixel-perfect mockups are critical. 10 to 3 to 1. Paired design meetings. Brainstorm meeting. Production meeting. Pony meetings. What else does Apple do differently? 1. Apple does not do market research. 2. Apple has a very small team who designs their major products. 3. Apple owns their entire system. 4. Apple focuses on a select group of products. 5. Apple has a maniacal focus on perfection. So is it possible for you to innovate like Apple? You need a leader who prioritizes new product innovation. You need to focus. You need the right people, and you need to reward them. Have you ever wondered how to nail a pudding to the wall? I guess I figured it out: — freeze the pudding first! Guy Kawasaki interviewed Harmut Esslinger. How does Steve Jobs’s mind work? Why is it that companies with billions of dollars who can hire any designer or design firm in the world put out such crappy products? Can customers truly tell a company how to innovate? What can customers do then? If a company is hiring a design firm, how can it know that it’s picking the right one? If a company is hiring a designer (as an employee), how can it know that it’s picking the right one? What are your top ten products of all time? What are your ten worst products of all time? Why has the One Laptop Per Child project met with limited success? If a young person wants to be a great designer, what should he or she do?